Casuarina is a lavish waterfront condominium building settled between the Intracoastal and Atlantic Ocean in Highland Beach, Florida. Standing 11 stories tall with 54 condos, Casuarina provides an intimate living space in tropical paradise. From your wrap around balcony, you will see stunning views of the water, as well as lush greenery and city skyline. Each residence ranges in size from 1,500 square feet to 2,500 square feet features many designer furnishings such as oversized kitchens, granite countertops, walk-in closets, huge master bedrooms, spacious floor plans, roman tubs, and stainless steel appliances. These two and three bedroom Casuarina condos are safely secured by 24 hour security and a doorman. Residents even have access to underground parking and extra storage on the property. 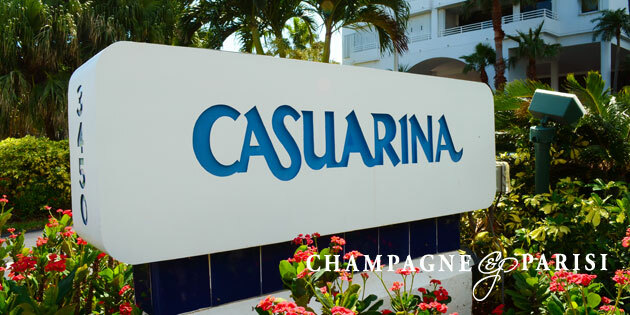 Casuarina wasn’t built for residents to just stay inside, the exquisite building also comes with resort-style amenities for everyone’s enjoyment. Among these amenities are easy beach access to a private beach, heat pool and hot tub, tennis courts, shuffleboard courts, brand new fitness center, and sauna. The surrounding cities of Delray Beach and Boca Raton also offer plenty of activities for residents. Between the famed Downton Delray Beach Atlantic Ave, upscale Town Center Mall in Boca Raton, and dozens of boutiques, fine dining, and entertainment, residents of Casuarina in Highland Beach will always have something to do.